Money management is a way Forex traders control their money flow: literally IN or OUT of own pockets... Yes, it's simply the knowledge and skills on managing own Forex account. Forex brokers will rarely teach traders good money management skills, though almost all brokers will offer some sort of education, therefore it's important to also learn on your own. The main idea of the whole trading process is to survive! Survival is the first task, after which comes making the money. One should clearly understand that good traders are, first of all, skillful survivors. Those who also have deep pockets can additionally sustain larger losses and continue trading under unfavorable conditions, because they are financially able to. 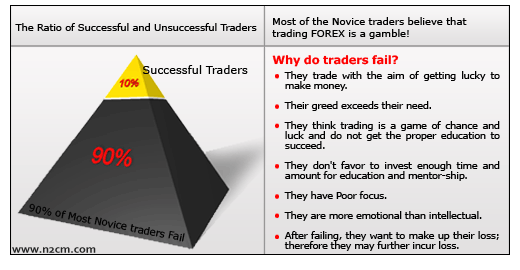 For an ordinary trader, the skills of surviving become a vital "must know" requirement to keep own Forex trading accounts "alive" and be able to make profits on top. Apparently, there is a big difference between risking 2% and 10% of the account balance per trade. A trader who has made 10 trades risking only 2%, under the worst conditions would lose only 17% of his initial investment. The same trader who had been exposing 10% of the balance per trade would end up losing over 60% of his initial investment. As you can see, this simple decision — a money management approach — can have serious consequences if misjudged.